Morning Prayer during the 50 days of the Easter season may begin with the Easter antiphon and the canticle “Christ our Passover” instead of the Venite. It’s a lovely way to mark these 50 days — one-seventh of the Church Year — as a sort of Sunday to the rest of the week. Christ has been raised from the dead, the first fruits of those who have fallen asleep. 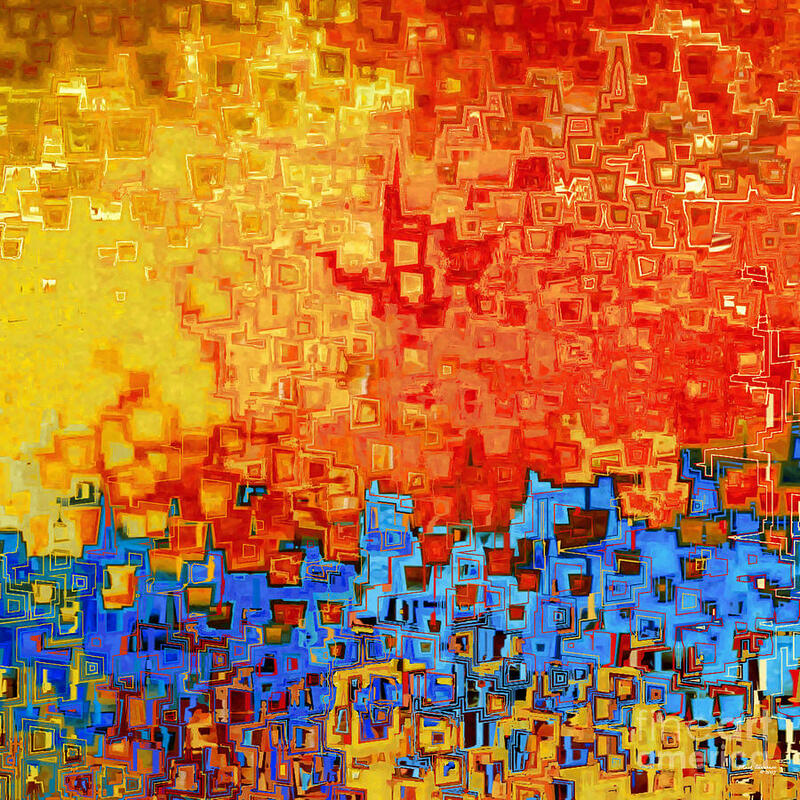 This entry was posted in Daily Office, Easter and tagged Christ our Passover, Morning Prayer, Pascha Nostrum on April 5, 2015 by Rodger Patience. In early Christian art, Christ is often depicted as a Passover lamb, sometimes flanked by twelve other lambs representing the apostles. By the Middle Ages, it was more common to show the lamb holding a banner or pennant symbolizing the resurrection. This is the image commonly known as the “Agnus Dei,” Latin for Lamb of God. The Agnus Dei is a symbol of victory through sacrifice. “Christ our Passover has been sacrificed for us” we say when we break the bread at the Eucharist. “Christ being raised from the dead will never die again” we sing at Morning Prayer throughout Easter. In the Collect for Peace, which we pray on Tuesday mornings, we ask God to “Defend us, your humble servants, in all assaults of our enemies; that we, surely trusting in your defense, may not fear the power of any adversaries; through the might of Jesus Christ our Lord” (BCP 99). We do not ask to be delivered from assaults; we ask to be defended in assaults. And we pray that we may not fear any other power, because of the might — the sacrificial, self-offering mighty power — of Jesus Christ, the Lamb that was slain. As we “consider ourselves dead to sin, and alive to God in Jesus Christ our Lord” we can embrace the same self-giving love that Jesus demonstrated. Undefended, humble, and alive to God, we need not fear any adversaries. Alleluia! This entry was posted in Daily Office, Easter and tagged Agnus Dei, alive to God, Christ our Passover, Easter, humble, Invitatory, Lamb, Morning Prayer, Pascha Nostrum, undefended on May 6, 2014 by Rodger Patience. 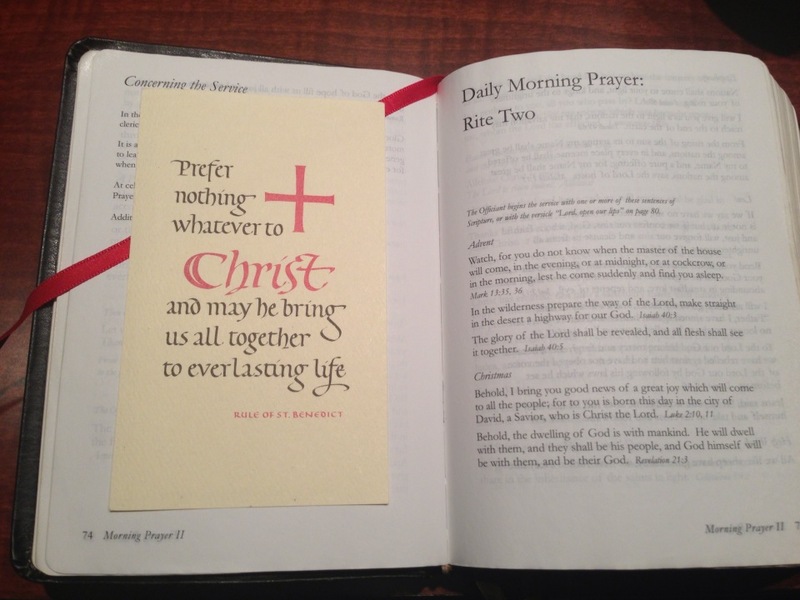 Yesterday we prepared to say the Office by finding our place in the Book of Common Prayer and marking various places in the prayer book and Bible for easy reference. Today we will begin the Office, looking at the opening sentences, the Confession of Sin, the Invitatory and Psalter. Tomorrow we will look at the Lessons and Canticles, and the next day at the Prayers. At Evening Prayer (and other offices throughout the day), the opening sentences are “O God, make speed to save us. / O Lord, make haste to help us.” (BCP 117). You’ll notice, though, that there are several pages of material printed before those opening sentences. You may choose to begin the Office with a seasonal sentence from Scripture and/or the Confession of Sin. Look at BCP 75-78. You’ll see four pages of Scripture verses chosen to fit the seasons of the Church Year. You might choose to begin the Office with one of these sentences in order to give your prayers the “flavor” of the season. This is especially helpful to distinguish seasons like Advent and Christmas, Lent and Easter, from the long “ordinary” seasons after Epiphany and Pentecost. Since it’s Advent now, you might choose to begin with “Watch, for you do not know when the master of the house will come …” (BCP 75). Over the next four weeks, you might change it up a little by using one of the other two choices. Look at BCP 79. The italics at the very top of the page are called rubrics. They are directions telling you what to do next. In this case, the rubrics say, The following Confession of Sin may be said; or the Office may continue at once with “Lord, open our lips” (BCP 79). “May” is an important word in the rubrics, and it means what it says. You don’t have to say the Confession every time you say the Office; you may say it. Many people who say both Morning and Evening Prayer choose to say the Confession only in the evening. In this somewhat more penitential season of Advent, and certainly in the season of Lent, it may seem right to say the Confession at every Office. Again, the choice helps us focus on the season of the Church Year and its emphases. When you say the absolution at the top of BCP 80, change the pronouns from “you” to “us” — you’ll see the rubrics there to remind you. It’s customary to make a sign of the cross with your thumb over your lips when you say “Lord, open our lips” at Morning Prayer and to make the regular sign of the cross at the sentence “O God, make speed to save us” at the other offices. Lord, + open our lips. The Office begins with a selection from the Psalter, which you looked up in the Daily Office Lectionary and marked with a bookmark. Before you say those Psalms, however, you say the Invitatory (or opening) Psalm. There are two Invitatory Psalms, called Venite and Jubilate after the first word of the Psalm in Latin: “Come” and “Be joyful,” respectively. Because the Venite is commonly used all the time as the Invitatory, you might like to use the Jubilate during Advent and Lent, just to set the season apart a little. There’s also a special canticle called Pascha nostrum, or “Christ our Passover,” that’s meant for use during Easter. Again you’ll notice some optional material on BCP 80-82 before the Invitatory Psalms are printed. These are antiphons, or refrains, which you may use in order to give a seasonal flavor to the Venite or Jubilate, which you say every day. Our King and Savior now draws near: Come let us adore him. The Office continues with the Psalms appointed for the morning or evening. You may say the “Glory to the Father” at the end of all the Psalms, or at the end of each individual Psalm. Before you turn to the Psalms, though, let me suggest that you refer to the Table of Canticles that you printed out from the Resources page and taped here at BCP 84. Move your Morning Prayer bookmark or ribbon to mark the canticle assigned to follow the first reading. Today is Monday, for example, so Canticle 9 is appointed to follow the OT reading. If you take a moment now to mark it, you can read the Psalms, then turn directly to the OT lesson, then when you come back here, you can continue on with the Office very smoothly. 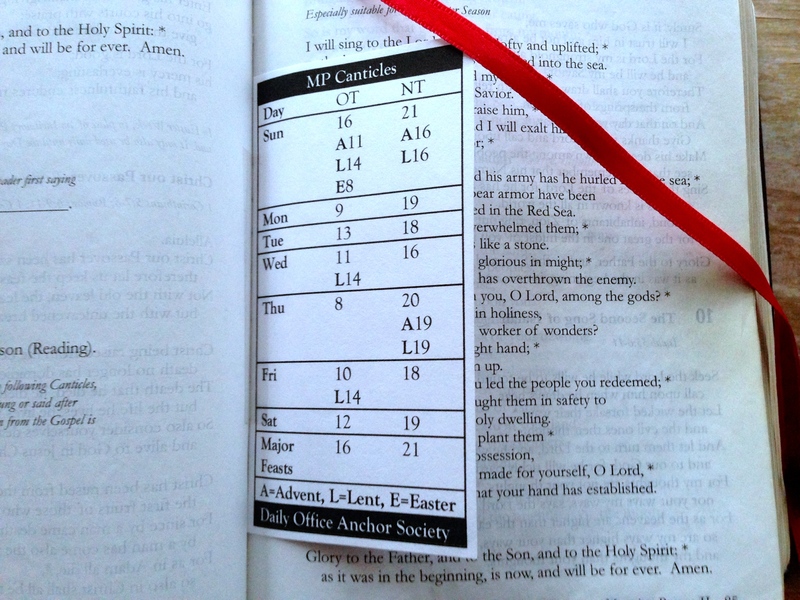 What you’re doing with your Morning Prayer bookmark or ribbon is holding your place in the service as you turn to the other resources you need for the Office: the Psalms, the Scripture readings, the Collects and other prayers. We’ll look in more detail at the Lessons and the Canticles tomorrow morning. Until then, I hope the Office is beginning to feel a bit more manageable. Every blessing! This entry was posted in Daily Office, Daily Office Basics and tagged absolution, Advent, antiphons, canticles, Christmas, Confession of Sin, Easter, Evening Prayer, Invitatory, Jubilate, Lent, Morning Prayer, opening sentences, Pascha Nostrum, Psalms, sign of the cross, Venite on December 2, 2013 by Rodger Patience. This entry was posted in Daily Office and tagged Christ our Passover, Easter, lamb of god, Morning Prayer, Pascha Nostrum on March 31, 2013 by Rodger Patience.